In order to assess whether Leonarda Cianciulli was actually a psychopath, the following assessment tools were used. Developed by Robert Hare, this check list is comprised of items that combine to describe a psychopath. Each item is evaluated and scored on a scale of 0 to 2. The average person will likely score below 10. A score of 30 or higher would qualify you as a psychopath (Hare, 1999). Note: I am not trained to administer this test, nor was a formal guide used. This analysis is based on the characteristics described in "Without Conscience" by Robert Hare and Robert Hare's PCL-R. There is no evidence that Leonarda lied pathologically, but she was willing to lie to her victims in order to lure them to her house. There is no evidence of this characteristic. According to this analysis, Leonarda scored a 16 out of 38 on the PCL-R. So based on Robert Hare's measure, she would not be classified as a psychopath. Psychopathy can be understood as either dimensional or ﻿categorical﻿ construct (Patrick, 2007). A categorical model means ﻿you either are a psychopath, or you are not﻿. A dimensional model reflects a continuum of psychopathy; you can be a little psychopathic, or a lot. A categorical model states there is one kind of psychopath. A dimensional model recognizes two types of psychopaths: primary and secondary. A primary psychopath is known as the "true psychopath" and typically have very high PCL-R scores. They were psychopaths since childhood. A primary psychopath experiences primary detachment since infancy and human disidentification. In other words, they cannot form bonds or connections with others. A secondary psychopath may be diagnosed as having Antisocial Personality Disorder. Secondary psychopaths detach later in life and tend to have lower PCL-R scores than primary psychopaths. So, they cannot form attachments, but they once could. They often show more social deviance (such as criminality). she is a secondary psychopath. 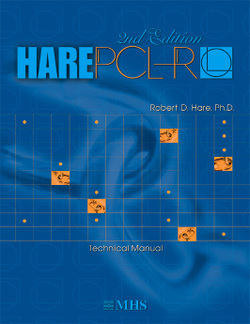 Hare, R. (1993). Without Conscience. New York: Pocket Books. Helfgott, J. (1/16/2014). CRJS 450 Lecture. Seattle University. Patrick, C. J. (2007). The Handbook of Psychopathy. New York: Guilford Press.